The International School of Moscow will inspire your child to love learning, and give them the skills and ambition to succeed anywhere. Moscow is one of the world’s most recognisable cities, and a home to classic literature, culture and architecture. For families that call the city home, The International School of Moscow is the one of the leading choices for an education that can inspire success anywhere in the world. The school is located across two of Moscow’s most exclusive areas: the ISM Krylatskoe campus near a national park - with its state-of-the-art sporting facilities - and the picturesque ISM Rosinka site, in the midst of a picturesque community of friendly families. 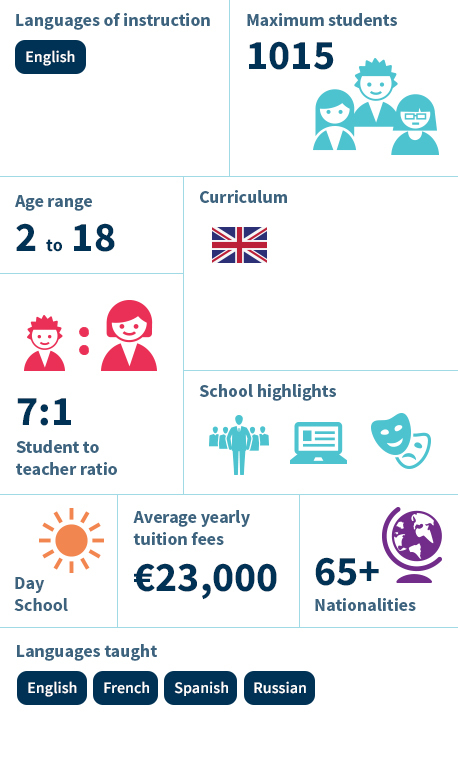 The International School of Moscow (ISM) provides excellence in both academia and personal development across two campuses to students from Early Years through to Sixth Form. The school has been graded as excellent in all areas of its provision by the Independent Schools Inspectorate, and the majority of ISM Sixth Form students secure their first choice places at top international universities.